Confession: I have never been a fan of mint. Never liked it with chocolate, or in a julep, or … is there anything else? And its promiscuous growing habits, ugh. I made the rookie mistake of planting mint in the ground, where it threatened to take over the entire garden. So I moved it into planters, where its minty roots would sneak through the drainage holes and reappear – surprise! – as evil volunteers around the pots. Finally, after many years, it occurred to me to put the mint into a container and set the container on a stone wall. Ha! Mint tamed. Once I established my dominance, it became easier to admire mint. It resurrects early in the gardening season with other hardy herbs like rosemary, thyme, oregano, sage and chives. I love these fresh herbs and greedily scatter them in my spring cooking whilst everything else in the garden is just a promise of goodness to come. I don’t have Clementina’s recipe, but I am so enamored of this pasta that I’ve tried to replicate it. Enjoy mint in a new twist. And tell me if you have a savory mint dish; it might help reinforce my changing opinion of it. Saute the mushrooms in the butter and olive oil over medium heat. Meanwhile, heat water for the pasta to the boiling point. When the mushrooms are tender, immerse the pasta in the boiling water and cook to al dente. Add the garlic, mint, lemon zest and juice to the mushrooms in the pan. Then add the broth with salt and pepper to taste. Drain the pasta and add it to the mushroom mixture in the sauté pan. Briefly cook to blend the flavors. Divide among pasta bowls, top with a sprig of mint, and serve with shredded parmesan cheese. With salad, a crusty baguette and a crisp sauvignon blanc, this is a memorable and minty meal. Serves 3-4. Thank you for sharing the recipe, Sandy (found it on the Flavor Magazine blog). I love mint and its many many variations (lemon, orange, chocolate, pepper, spear, apple etc) and had never thought of using it in pasta. I hope you will try mint in other dishes: grain salads, mint pesto and salsa, potato salad. 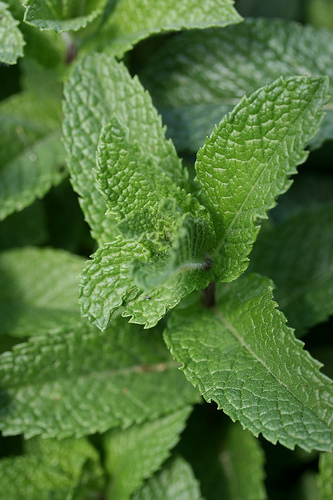 And yes, many Sicilian and Calabrian recipes (Calabria a cuisine I am greatly attracted to) use mint.